The third day of the UK Open dawned – it was rather grey outside, not really dry and it stormed. 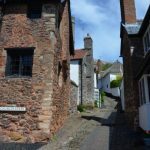 Not nice for hiking but when Coleridge was on his way in March 1798, he had to take a break in an inn in Lynton as a thunderstorm descended on him. 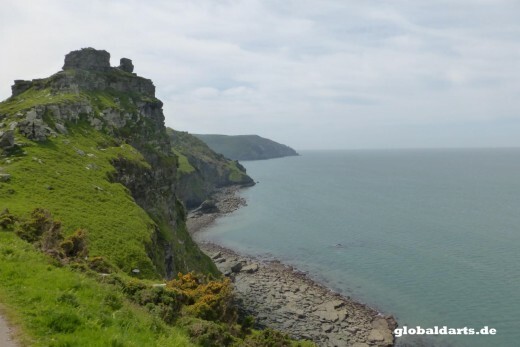 Nevertheless, he walked together with his friends – he was accompanied on that day by fellow writer William Hazlitt and John Chester, the son of a local farmer – further on to the Valley of Rocks. The Valley of Rocks today is a well-developed tourist attraction. 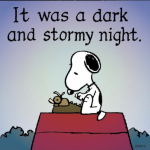 At Coleridge’s time I suppose it was much wilder and very rough and probably in the stormy atmosphere quite scary. The ramblers at this time had to take the steep ascend from Lynmouth to Lynton by foot. 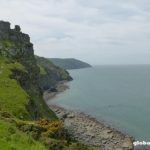 Now-a-days, they can have a drive as the little harbor, Lynmouth, offers an attraction which connects it to Lynton – the cliff railway. It’s the world’s steepest and longest railway which is only moved by sea water and it has existed since 1890. Lynmouth is not only well-known because of the railway but as well by the Lynmouth catastrophe, a flooding disaster which happened in August 1952. It had rained strongly for 24 hours and the two rivers which merge here brought with them a mud and boulder slide which destroyed two-thirds of the village and killed 35 people. From time to time rumors would abound that the reason for the rain being so strong was that the Royal Air Force had seeded the clouds to find out whether and how one could influence the weather for military purposes. But there never was an official affirmation. Though one heard that flights were cancelled due to the strong winds on the last day of the UK Open in Minehead it had no serious consequences. Only the roof of the Sky Pavillion above the main stage – where all matches on the last day were played – moved quite a lot. And luckily none of the players who were defeated on the day looked like a disaster had befallen them. In the evening session they all just looked tired. First out of the tournament was Josh Payne who lost in the first quarterfinal to Rob Cross. 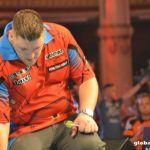 Payne played the better average – well, he also played more consistently – but Cross had a few really good legs which were in the end enough for a 10:7 win and a place in the semi-finals. Both players were clinical on their doubles. The second quarterfinal was over very fast and the second player out of the event was Steve Beaton. Michael Smith looked better than on the day before and seemingly felt better as well. Beaton had no chance at all and only won a single leg. In the next quarterfinal it was Simon Stevenson who had no chance at all though he won a few legs more than Beaton. But Gerwyn Price was just too much for him – not really astonishing as Price had played so far consistently high-quality performances. I suppose Stevenson was not too disappointed – he had reached the quarterfinals and beaten on his way Kim Huybrechts, Raymond van Barneveld and Dave Chisnall. And all that while he was “only” the number 68 of the world. In the last quarterfinal two players met who probably no one before the tournament had counted among the favorites to win the event – but both had played convincingly: Nathan Aspinall and Ross Smith. Ross looked like he didn’t have much left in the tank, and he lost 6:10. At least he was, like Aspinall, quite sure on his doubles. A last draw for the semi-finals followed – three top ten players and one underdog were still in the tournament. After the break – which was this time quite long – the semifinals started, and Nathan Aspinall and Gerwyn Price walked on stage first. To be sure Price was the favorite to win the match as until now he had played really well and besides was much more experienced in this context. But… Nathan Aspinall didn’t seem to be nervous at all and was soon into the match and in the lead. He kept on increasing the lead and only when he needed just a bit more to win did, he became a little bit shaky. Price managed to reduce his deficit. Aspinall missed with his first two match darts and at 10:9 the match went into a deciding leg. 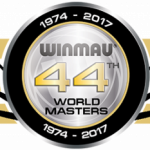 Price couldn’t find the bullseye to draw and Aspinall kept his nerve to hit the double 14 to progress into his first televised final. Despite his defeat Price seemed to be delighted with Aspinall’s win and was a very fair loser. By this he no doubt won back a lot of the support he had lost due to his behavior in the Grand Slam. The whistles against him had dwindled anyway during the tournament. The second semifinal was far less thrilling. For me it looked like Michal Smith finally had given in to his pain and only hoped the match would be over soon. So, Rob Cross had not many problems to defeat him 11:7. Smith had only from time to time some good throws but was far less clinical and impressive then in his other matches. What a pity for Smith – had not his injury hindered him he would really have had a chance to win the event. But he was on this day not a serious opponent for Cross. Cross seemed to be compassionate after the match probably it had not been easy for him to play against an opponent who was so burdened with an injury. And so, the rather astonishing final of this year’s UK Open was Nathan Aspinall vs Rob Cross – something we knew even without a draw! There was not much time for the players to recover from their semi-finals – especially not for Rob Cross who had played in the second semi-final. 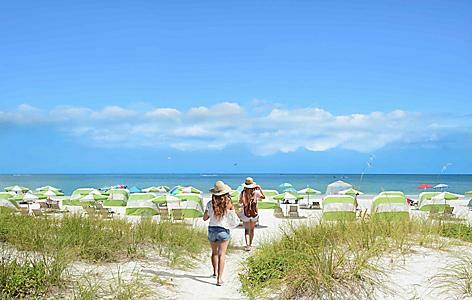 But it was already late – you just couldn’t take a long break. Rob Cross somehow didn’t get into his stride in the final. He admitted afterwards he felt he had no power left after all the matches of the weekend. Aspinall played not as well as before too – might be it was because it was his first ever televised final. So, the final was not really the highlight of the tournament or a high-class match and even a little bit one-sided in the end. Cross only managed to keep up until 4:5 but he didn’t manage to draw even – though he had six darts for it. Aspinall used the chance and hit his double 10. After that, Cross only won one more leg and Aspinall had no problem at all to get a clear win. Right at the very end of the match Aspinall produced a moment of magic – he threw a 170-finish to win the match and the title. Not often before did it happen a player won a tournament with a 170 finish! So, Aspinall could celebrate a deserved win! And Cross looked as delighted as did the crowd and Aspinall’s granddad who had by now come to fame. After Lauwrence Lustig had taken his official photos we other (three) photographers were allowed to come on stage as well to take our own shots. And with that – this year’s UK Open was history. 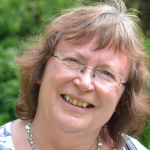 The founder of Global Darts, darts journalist Charis Mutschler hails from Marbach, near Stuttgart, Germany. 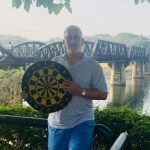 A regular at most major PDC tournaments, a lover of literature, dance and music and cats, Charis' popular writings about darts and its players often transcend the usual. She brings something unique to the chroniclers of the sport we all love.